One suspect was killed and four police officers were slightly injured Tuesday when a raid tied to last year's Paris terror attacks erupted in gunfire, officials said. 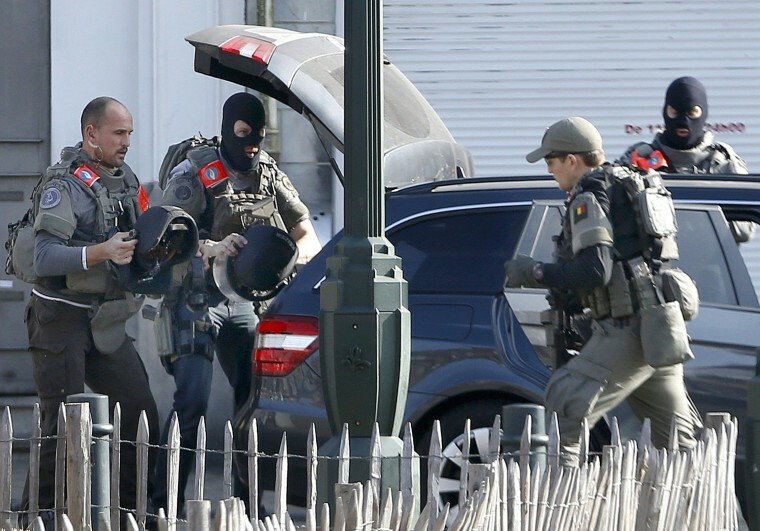 The joint counterterrorism operation involving Belgian and French police took place at a house in the Forest section of Brussels, authorities said. The targets were a group of people connected to those already charged in the Nov. 13 attacks, a police source told NBC News. As officers breached the doorway, one or more people began shooting at them from inside, the Belgian federal prosecutor's office said. Three officers were hurt, and a fourth was injured in a later exchange of gunfire. One of the gunmen, armed with a Kalashnikov rifle, was killed, the prosecutor's office said. Footage from the scene on rue du Dries showed heavily-armed officers taking up positions with guns drawn. Locals were told to remain in their homes. Nurseries and schools were evacuated. When the gunfire ended, police search the house and found the suspect's body, the prosecutor's office said. It remained unclear if any others escaped. Three of the injured police officers were Belgian, and one was French, Belgian Justice Minister Koen Geens said. All suffered relatively minor injuries, officials said. Several of the terrorists behind the Nov. 13 terror attacks in Paris had ties to Brussels. At least 10 people have been charged and are in Belgian custody in connection with the attacks, which killed 130 people across the French capital. Among those still at large is Salah Abdeslam, a French national who fled Paris after the attacks. He was not a target of Tuesday's raid, the police source said. Nancy Ing and Jon Schuppe contributed.